I had a potluck at work last week, and I decided to bring this vegan zucchini bread. Since not everyone likes nuts or chocolate chips, I had a great idea. Instead of making two normal size loaves, I got smaller tin loaf pans at the grocery store. These 2 pound loaf pans (8in x 3 3/4in x 2 3/8 in) allowed me to make three separate loaves. I made the original vegan zucchini bread recipe and put a third of the batter into the first pan. Then I divided up the remaining batter and added a half cup of chopped walnuts to one loaf and a half cup of vegan chocolate chips to the last remaining loaf. I ended up with three small loaves: vegan zucchini bread, vegan zucchini walnut bread, and vegan zucchini chocolate chip bread. I wanted to share this recipe with you all because I thought it would be a great idea for the holidays, which are coming up quite soon. You can easily make these three smaller loaves and please everyone! Vegan zucchini bread batter. 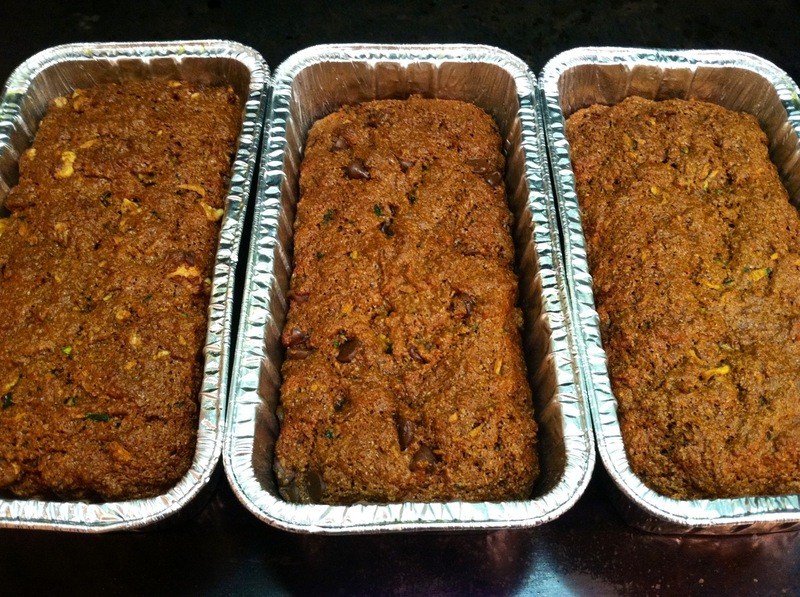 From left to right: Vegan zucchini walnut bread, vegan zucchini chocolate chip bread, and vegan zucchini bread. Preheat your oven to 350 degrees Fahrenheit/180 degrees Celsius. You will need two mixing bowls, one large-sized and one medium-sized bowl. In the medium-sized mixing bowl, combine all of your wet ingredients. This will include your 2 1/2 cups of grated zucchini, 1/2 cup of safflower oil, 3/4 cup of applesauce, and 1 tablespoon of vanilla extract. Mix well. Note: I used safflower oil because it’s a light vegetable oil that’s high in vitamin E. It also has one less gram of fat than canola oil or regular vegetable oil. But you can easily substitute canola oil or regular vegetable oil instead of the safflower oil if you prefer. Zucchini bread just out of the oven. 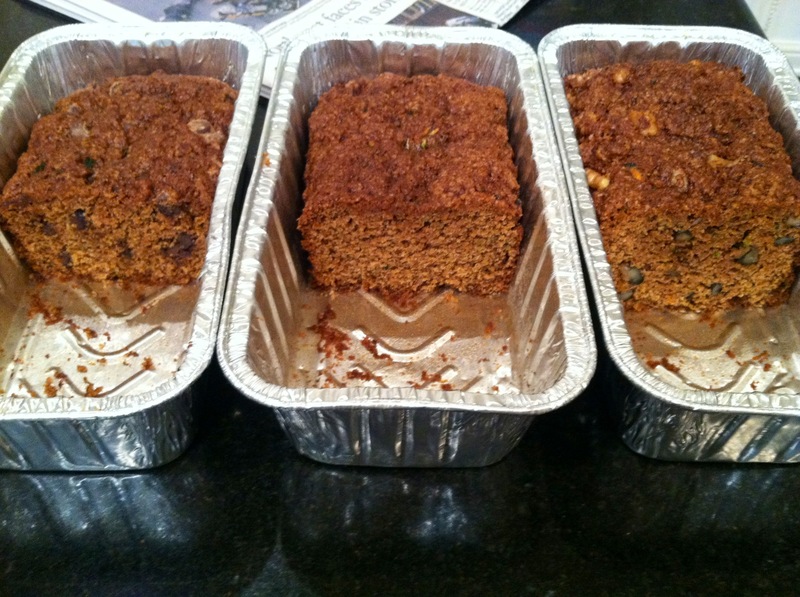 From left to right: vegan zucchini walnut bread, vegan zucchini chocolate chip bread, and vegan zucchini bread. In the large-sized mixing bowl, combine all of your dry ingredients. This will include your 3 cups of whole wheat flour, 2 cups of brown sugar, 1 tablespoon of baking soda, 1 tablespoon of cinnamon, 1 teaspoon of nutmeg, 1 teaspoon of baking powder, and 1 teaspoon of salt. Mix well. Then add your medium-sized bowl of dry ingredients to your large-sized bowl of wet ingredients and mix well. The batter will be thick and will take a couple minutes and some arm power to ensure that the batter is thoroughly mixed. Once your batter is well mixed, take out your loaf pans. 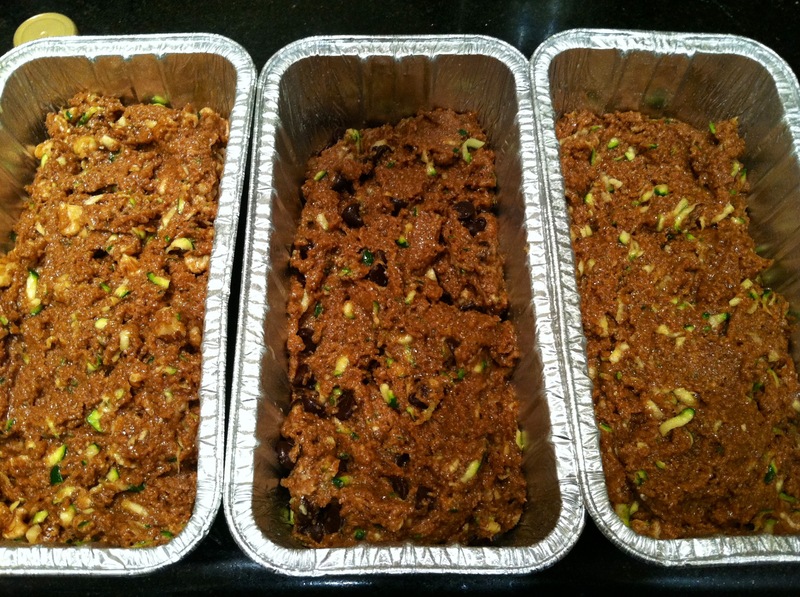 I used three 2 pound loaf pans (8in x 3 3/4in x 2 3/8 in) to make the three different zucchini breads. Grease the three loaf pans well with canola oil spray or olive oil spray to ensure that the bread doesn’t stick to the pan. If you are using nonstick bread pans, you can skip this step. Pour out one third of the vegan zucchini bread batter into one of the loaf pans. Then divide up the remaining batter for the other two loaf pans. Add a half cup of chopped walnuts to one half of the remaining batter and a half cup of vegan chocolate chips to the other half remaining batter. Pour the vegan zucchini walnut batter into one loaf pan and pour the vegan zucchini chocolate chip batter into the last loaf pan. Bake in the oven at 350 degrees Fahrenheit/180 degrees Celsius for about 35 to 40 minutes. Let cool about ten minutes. Then enjoy your three different vegan zucchini breads! Below you’ll see, I’m providing nutrition facts for one serving of all three breads: the vegan zucchini bread, the vegan zucchini walnut bread, and the vegan zucchini chocolate chip bread. If you read the descriptions, I’ll point out how each variation of bread slightly differs in terms of nutrition facts. One serving, one slice, of the vegan zucchini bread will give you 164 calories, 80 milligrams of potassium and 2 grams of protein. It will also give you 36 grams of your total carbohydrates, 2 grams being dietary fiber. In terms of vitamins, this vegan zucchini bread will give you 1% of your daily vitamin C and 9% of your daily vitamin E.
In terms of minerals, one serving will provide you with 2% of your daily copper, 3% of your daily calcium, and 6% of your daily manganese. One serving of vegan zucchini walnut bread will give you 213 calories, 113 milligrams of potassium and 3 grams of protein. This is 49 more calories, 33 more milligrams of potassium and one additional gram of protein. One slice will also give you 37 grams of your total carbohydrates (one additional gram as compared to the vegan zucchini bread), 2 grams being from dietary fiber. In terms of vitamins, one serving will give you 1% of your daily vitamin C, 2% of your daily vitamin B-6 and 10% of your daily vitamin E. The walnuts add the vitamin B-6 and 1% of the vitamin E as compared to the zucchini bread. 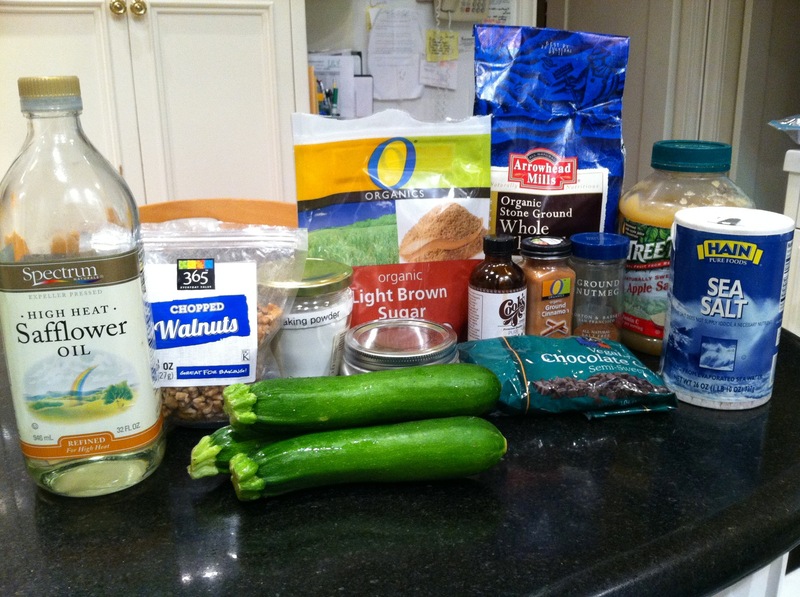 One slice of vegan zucchini walnut bread provides you with more minerals. This includes: 3% of your daily phosphorus, 4% of your daily magnesium, 8% of your daily copper, and 18% of your daily manganese. One serving of vegan zucchini chocolate chip bread will give you 234 calories, 80 milligrams of potassium and 2 grams of protein. This is 70 more calories than the original vegan zucchini bread. It will also give you 45 grams of your total carbohydrates, 3 grams being dietary fiber. This is 9 additional grams of carbohydrates and one additional gram of dietary fiber, as compared to the original zucchini bread. 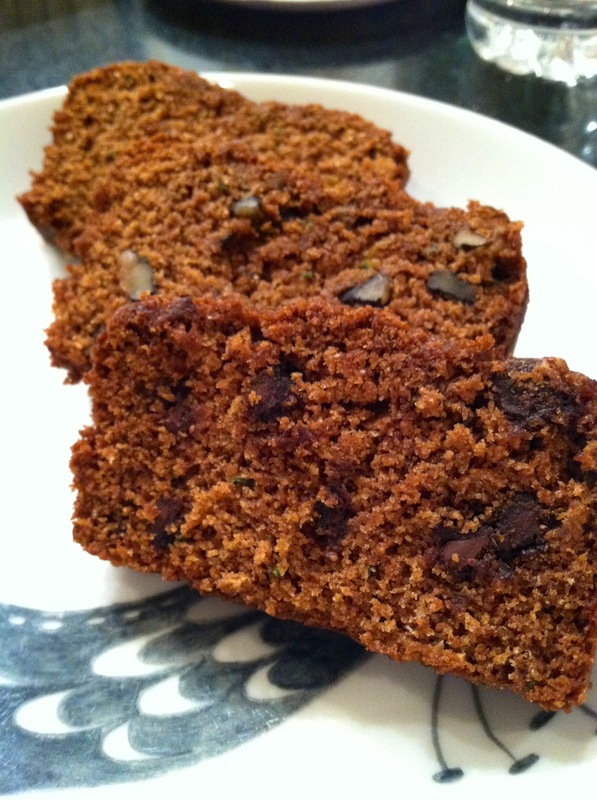 The vegan zucchini chocolate chip bread will give you 1% of your daily vitamin C and 9% of your daily vitamin E. It will also give you 2% of your daily copper, 3% of your daily calcium, and 6% of your daily manganese.